The Maryland Civil Air Patrol was on a mission. The target? The News 4 I-Team. Reporter Tisha Thompson was all by herself in the woods. She was supposed to be a pilot who survived a crash. Two large tarps were on the ground next to her. Folded into the shape of a giant arrow, they mimicked the silhouette of a downed airplane. The question was, Where is Tisha? Capt. Harvey Dalton flew as close to the ground as he could looking for the simulated plane, but the tree cover is thick. "As a crew we couldn't see the ground,” he later explained. “We could only see the trees." It’s a common problem. The Air Force Rescue Coordination Center gave the News4 I-Team real life examples to show how hard it is to spot airplanes. When a plane crashed in Rutland, Vt., the leaves were all gone. But the wreckage blended in so well it could easily be mistaken as a thick stand of evergreen trees. In Willow Creek, Colo., a crash looked like fallen pines. One of the most striking examples was a tiny smudge on the side of a snow-covered mountain. 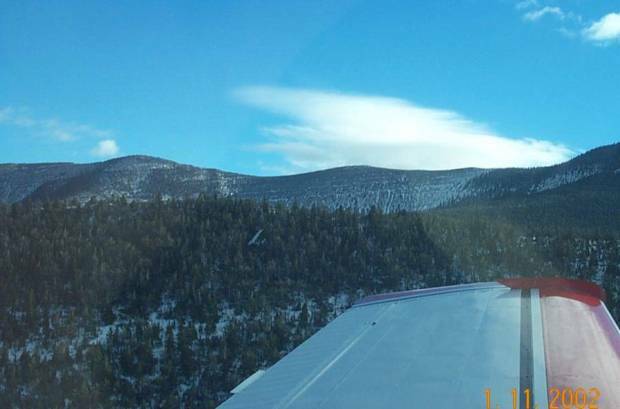 The white airplane blended into the giant snowfield, making it almost impossible to pinpoint. That is why the Federal Aviation Administration has required private planes to carry a 121.5 MHz beacon for 40 years. 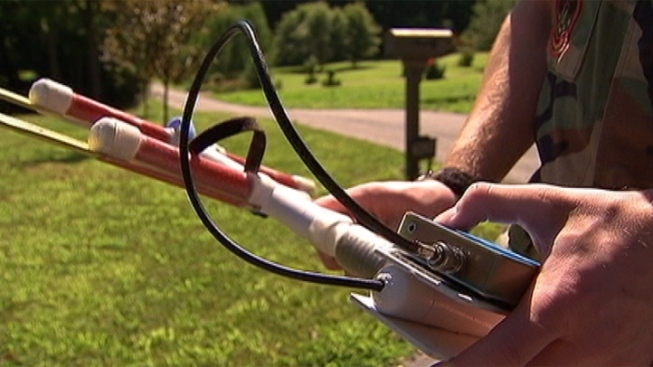 The emergency locator transmitter, commonly called an ELT, sends a homing signal that grows stronger as rescue crews in the air and on the ground circle in. In Maryland, Civil Air Patrol Col. John Knowles led the search for Tisha on the ground. "We've limited the signal to this area," he said as an antenna emitted a loud beeping noise. He and his crew plowed through poison ivy and up a rocky ravine. Following the signal as it got louder and louder, they found the I-Team. But that was a drill. Rescuers knew to start the search. That wouldn’t necessarily happen after a real crash. The 121.5 ELT used to be connected to a satellite that alerted search-and-rescue crews about a possible crash. But after years of false alarms and the advent of better technology, the federal government shut the satellite down in 2009. "So, it might take days before anyone would know that you were missing,” Knowles said. The National Transportation Safety Board now wants the FAA to mandate general aviation planes to carry a better beacon called the 406 MHz. Within seconds, it can send GPS coordinates to the Rescue Coordination Center, along with detailed information including a description of the plane, the name of the pilot and pilot’s emergency contacts. “It can be located as accurately as 30 meters,” The NTSB’s Earl Weener said. “Basically tells you where to do the rescue. You can skip the search." When Maryland’s Civil Air Patrol tested it out during the drill, the ground crew used the GPS coordinates to beeline for the I-Team’s position before the plane could even get in the air. “We can respond to somebody much, much faster," Knowles explained. But the News4 I-Team found only 17 percent of the nation's private planes use the 406 ELT. Melissa Rudinger with the Aircraft Owners and Pilots Association said the devices, which range from $500 to several thousand dollars, are too expensive. "We believe that giving pilots the option to purchase the type of search-and-rescue capability that they need for their type of operation is more appropriate than forcing the entire community to go to one standard,” Rudinger said. She said AOPA wants pilots to have the option to use satellite phones and cheaper GPS devices, some of which can be worn on the pilot’s body. But the NTSB points to the 2010 plane crash that killed Sen. Ted Stevens, where four Washingtonians survived but never knew a satellite phone was on board. NTSB Chairman Deborah Hersman also says you, the taxpayers, end up footing the bill for the search. During a recent NTSB meeting, she explained how it took a year to find the body of famed aviator Steve Fossett after his 2007 plane crash in Nevada. The cost? "$700,000 just for the state of Nevada,” Hersman said. “And that doesn't include the other searchers who were involved." People survive five out of six crashes, the NTSB said. The trick is to survive the search so crews like the Civil Air patrol can rescue you.